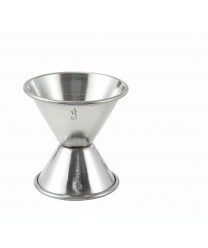 Ensure that you get your liquor proportions right with the Winco J-3 Stainless Steel Jigger, 3/4 oz. x 1-1/2 oz. This handy jigger is made of quality stainless steel, so it is durable and corrosion-resistant. It features opposing sides with different capacities, so you can flip it back and forth, as necessary.